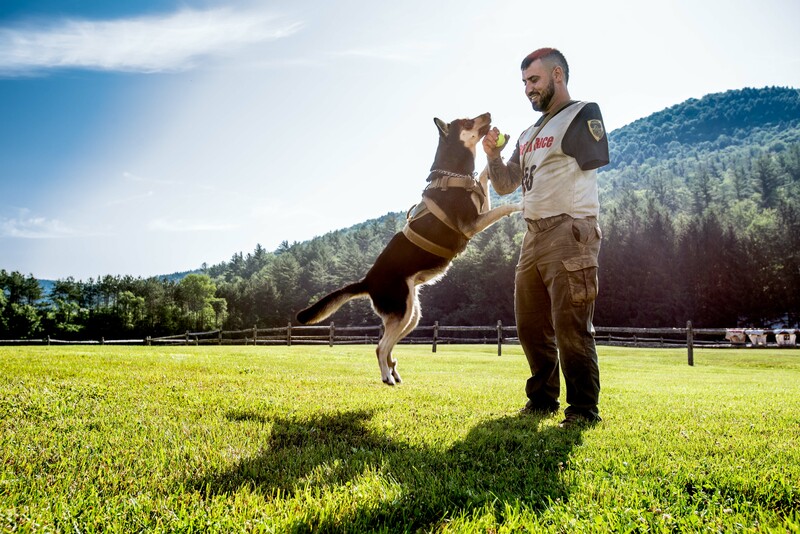 Jonathan Lopez, a U.S. Army Veteran and left-arm amputee, found loyalty, confidence and a lifetime race partner in his dog, Zoe. Not originally intended to be a service dog, Zoe quickly became the support and stability that Jonathan needed. I am writing this letter with the optimism that one day a doggy/English translation device will be invented and you will be able to read or hear these words and understand their meaning. They put a man on the moon, a Tesla in space and a one armed Veteran has learned to climb rope and rock climb. Anything is possible. When I was a kid I always grew up with dogs in my house and I remember loving having them around. The several K9 companions I had have since passed away but as an adult I have continued the tradition in my household. Around 2015, it had been a couple of years since my last dog passed away, the kids were getting bigger so I thought our family needed a pet. I figured it would help teach them some much needed responsibility. I did some research and decided we needed a male Malinois. You were neither male nor Malinois, but you were perfect. You were about 3 months old when I got you. Your mom had been found pregnant roaming the streets. When her litter was born, the family that took her in could not care for you and your siblings. I responded to an ad “looking for a home for puppies”. You were the friendliest pup we had ever met and there was an instant connection. I saw how much my kids loved you and I knew it wasn’t a coincidence that I came across that ad. I took you home immediately. I was keen on naming you, “Loba”, which means, “wolf” in Spanish. My kids had other plans, however, and they wanted to name you “Zoe”; They were right…you are absolutely Zoe. We went everywhere and did almost everything together and you quickly became part of the family. You walked the kids to school with me, went on family outings and even sat at the dinner table to eat with us. At first, we had a rough start with you obeying commands and responding to my call. But with time you learned to come when I whistled and heel on command. Around the time you turned one we ran our first obstacle course race together. It was a last-minute decision to put you on the course and I didn’t know what to expect. Although you had been coming with me to the gym from time to time, we had never really trained or prepared for this type of event. Despite not training for this kind of race, you killed it, and you have crushed every single race since. You gave that first race everything you had and slept for 12 straight hours when we got home. I knew you were exhausted but I’ll always remember that day because it’s the day we both found a love for the sport, together, as one team. As you know, I have a very obvious disability. I’m missing my left arm. When I was in the Army and stationed in Germany, I was hit by a drunk driver, subsequently ending my military career. I was in the hospital for over a year, recovering from my injuries that left me as a left arm amputee and with metal plates in my left leg. I had to learn how to walk again and do everything with just one arm. Simple things like tying my shoes or bathing were all new experiences to me. In addition to the physical pain and limitations, I had extensive emotional and mental trauma. The impact from the crash had left me with a traumatic brain injury. Once I separated from the military, I had to start my world all over. The civilian life was never something that I had prepared for and for many years I struggled with the realization that the plan I had for myself would not come to fruition. I was disappointed and depressed. Before I met you, there was a point in my life that I call my dark days. There were times that I questioned my mental clarity. I had moments where I lost my purpose and myself. There were a few times that I didn’t know if I would find my way back. I know that’s not something you would judge me for. I know you look at me and you don’t see my disability or my shortcomings. You love me simply and unabashedly. With you, I have felt acceptance and understanding. Eckhart Tolle once said, “When a dog looks at you, the dog is not thinking what kind of person you are. The dog is not judging you.”. You don’t judge, Zoe. You love. When people see me, they tend to stay away, not ask questions or avoid the topic all together. When small children walk by me, I can hear them say to their parents “Mommy that man is missing an arm!”. Almost 100% of the time, parents shush their children or tell them not to point or stare, and this is the opposite of what I truly want. I want people, especially children, to ask me “what happened” or anything else they feel comfortable with. I don’t want my disability to be hidden or taboo to discuss. It’s who I am and not something I am embarrassed of or shy away from. Talking about it with others makes it more acceptable or “normal”. Zoe, you have always been the ice breaker, bringing people closer to me when they see you. I am more approachable with you by my side. You are the first thing people notice, not my missing arm. You have made it possible for me to share my story with countless people and you have given me the confidence to open up to others and show the world where my passion lies. Over the last three years we have developed an extraordinary bond. It is one of the strongest and most sacred relationships that I have. You have become my best friend, my partner in crime, my racing companion, my teammate, my therapist and my family. You have been there for me when I needed someone the most. When I felt sad, you made me smile. When I have been nervous about public speaking, you sauntered around the room and used your friendliness to break the ice. When my thoughts have veered towards the negative, playing with you and being near you has gotten me thinking positive again. The truth is, your mere presence lightens my soul and fuels my energy. It’s that energy that drives us both through each race. I know being dragged through a 15-mile obstacle course may not have been your favorite thing to do the first time we did it, but now I can’t stop you from jumping those walls. At the beginning of races, when the music is blasting or the bagpipes are playing, I see you barking and jumping with excitement for the race to begin (I secretly believe you are pumped to beat all the other racers). I love carrying you on my shoulders, through muddy waters and over cargo nets and you have always been a trooper during each race. 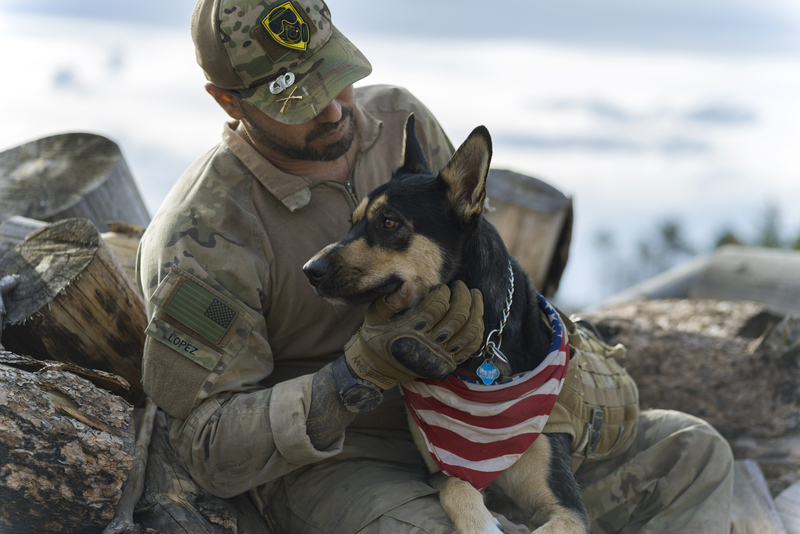 You have earned countless Trifecta medals and that’s something very few dogs, or people, can say. I cannot imagine all the bragging rights you have in your doggy world, but you don’t do it for bragging rights or to show off. You don’t do it for the camera or the fame. You are by my side every step of the way, just because. Because I am there. Because I am racing, or rucking or exercising, and I know you would follow me to the ends of the Earth. Your loyalty is unmatched. And that is not something I could ever buy or put a price on. Thank you for your unconditional love and affection. Thank you for wagging your tail every time you see me. Thank you for licking my face when you want attention. Thank you for barking late at night to ask to be let outside, and not peeing all over the house. Thank you for digging your nose into the Nulo dog bag when it may have slipped my mind to feed you. Thank you for being the amazing, sweet, kind and caring animal that you are. Thank you for giving me some of the best years of my life.